Mudbray in game: 860 Who? Important notice! Pokemon Mudbray is a fictional character of humans. Mudbray (Japanese: ????? Dorobanko) is a Ground-type Pokémon introduced in Generation VII. It evolves into Mudsdale starting at level 30. 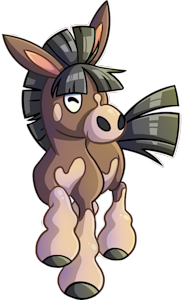 Mudbray is a quadruped, equine Pokémon resembling a small donkey. It has a dark brown coat with a cream-colored underbelly, muzzle, and circular markings on each cheek. A short, teardrop-shaped blaze extends up from its muzzle, and it has long, pointed ears with pink insides. Its large eyes have horizontal pupils. Black bangs hang over its face before turning into a stiff mane along its neck. Additionally, it has a short, black tail. Thick, cream-colored mud surrounds each black hoof. Because it was hunted nearly to extinction when it lived all over the world, it is believed to run wild only in Alola. This Pokémon boasts immense strength for its size, and is able to drag or carry loads up to 50 times its own weight. If Mudbray has a place where it can frolic in the mud, it is happy. However, it becomes stressed and may become disobedient if denied this pastime. Multiple Mudbray made their anime debut in SM011. 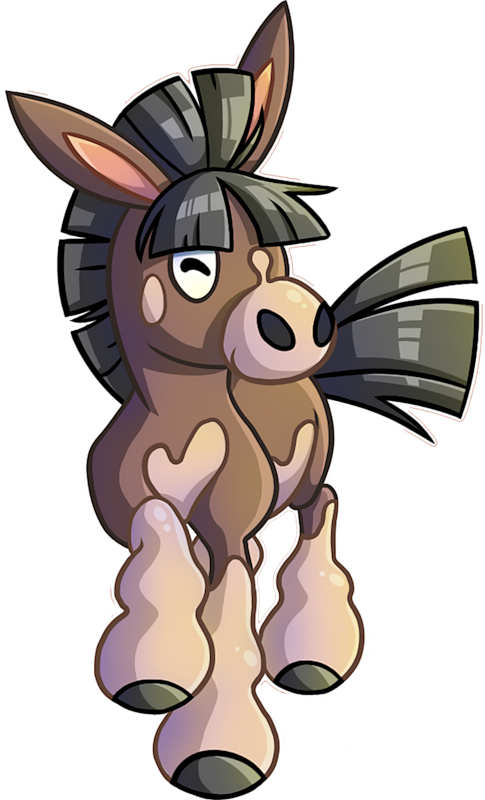 The mud stuck to Mudbray's hooves enhances its grip and its powerful running gait. Moves marked with a superscript game abbreviation can only be bred onto Mudbray in that game. Mudbray is based on a donkey. 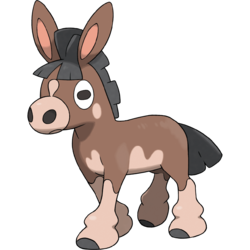 Mudbray may be a combination of mud and bray (cry of a donkey). Dorobanko may be a combination of ? doro (mud), ?? roba (donkey), ?? banba (draft horse), and ? ko (young animal). Korean ???? Meodeunagi From mud, ??? dangnagwi, and ?? agi.